On Friday, April 3, a student team from the Maryland Robotics Center demonstrated robots at the kick-off event of the National Robotics Week, held at the Smithsonian National Air and Space Museum in Washington, D.C.
National Robotics Week is an annual week of special events held across the U.S. that celebrate robotics research and technologies. It brings together engineers, scientists, students and their families who share a passion for robotics. 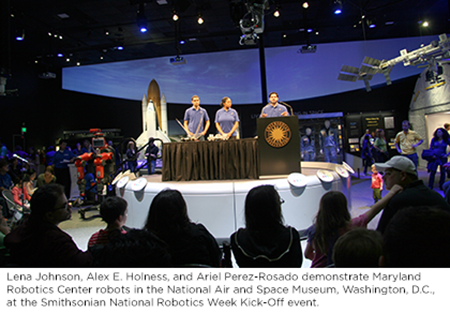 The week educates and inspires the next generation of scientists and innovators and "recognizes robotics technology as a pillar of 21st century American innovation." The Maryland Robotics Center students demonstrated bio-inspired robots to a large of crowd of national and international visitors. The Maryland team members included team leader Lena Johnson, Alex Holness, Ariyan Kabir, Joshua Langsfeld, Ariel Perez-Rosado, Brual Shah, Srudeep Somnaath and Shaurya Sriyam. Lena, Alex and Ariel also gave a formal ten-minute presentation about their robotic projects and held a Q&A session following.